Controlled cell death, or apoptosis, occurs in response to many different environmental stimuli. The apoptotic cascade that occurs within the cell in response to these cues leads to morphological and biochemical changes that trigger the dismantling and packaging of the cell. Caspases are a family of cysteine-dependent aspartate-directed proteases that play an integral role in the cascade that leads to apoptosis. Caspases are grouped as either initiators or effectors of apoptosis, depending on where they enter the cell death process. Prior to activation, initiator caspases are present as monomers that must dimerize for full activation whereas effector caspases are present as dimeric zymogens that must be processed for full activation. The stability of the dimer may be due predominately to the interactions in the dimer interface as each caspase has unique properties in this region that lend to its specific mode of activation. Moreover, dimerization is responsible for active site formation because both monomers contribute residues that enable the formation of a fully functional active site. 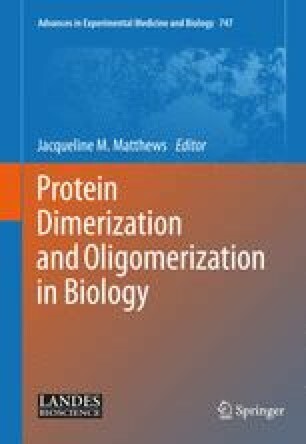 Overall, dimerization plays a key role in the ability of caspases to form fully functional proteases.